By Jason Davis – WASHINGTON DC (Oct 12, 2018) US Soccer Players - The United States Men’s National Team is in a weird place. A year out from losing to Trinidad & Tobago and missing out on the 2018 World Cup, one of CONCACAF leading nations is trying to figure out how to regain it’s lost prestige. During the October FIFA window, the Americans are playing friendlies against Colombia and Peru with an eye towards fixing what’s broken. Despite the anguish caused by missing the World Cup in 2018, the United States is still in a better position than the vast majority of its CONCACAF brethren. The fact that not going to Russia even represented failure speaks to the level of the American program. For everyone not named Mexico, Costa Rica, Honduras, or Panama, coming within a single game off qualification would be a massive achievement. One of the countries just trying to make their way to the relative top of the CONCACAF heap is Canada. The Canadians last appeared in a World Cup in 1986, four years before the Americans put together a qualification campaign to return to the tournament and before the rise of nations like Costa Rica and Honduras in the region. Since then, it's been a struggle. The long walk in the wilderness for Canada means that every international game, competitive or friendly, has real value. Countries like Canada figure to benefit most from the Nations League model, that strange competition cooked up by UEFA and now copied by Concacaf. That’s what Canada will be doing during this international window rather than playing friendlies like the United States, attempting to qualify for the top tier of the 2019-20 Concacaf Nations League. The purpose of the Nations League isn't to introduce yet another trophy of questionable value into the world soccer scene, though it does do that. Instead, it's to provide countries that struggle to get games a chance to build their programs. While that's not necessarily Canada's lot in life, there are a host of small soccer nations in the region that would not otherwise play during this window if not for the Nations League. The first CONCACAF Nations League qualifiers took place last month. The top six countries, those teams that reached the final round of World Cup qualifying for 2018, are already in “League A” of the Nations League proper. The qualifiers aim to sort the remaining CONCACAF countries into tiers ahead of next year's start to the full tournament. Every team in the qualifying phase, 34 in all, will play two home games and two away games from September of 2018 through March of 2019. The top six teams join the seeded teams in League A, the next 16 in League B, and the last 12 in League C.
Canada defeated the US Virgin Islands 8-0 in Bradenton, Florida last month to start their Nations League campaign. 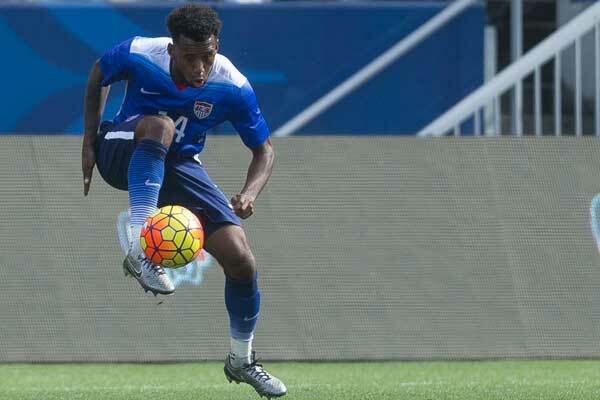 That took place at the IMG Academy because the US Virgin Islands lacked a suitable home venue for the game. On Tuesday, they'll face Dominica at BMO Field in Toronto. Neither represents much of a challenge, with the larger benefit falling squarely on the side of the small island nations. For Canada, the payoff comes later, provided they manage to make it into League A. Of note: the top ten finishers in the Nations League qualifying round will join last cycle’s Hex group to make up the field of the 2019 Gold Cup. After the first matchday, Canada sits in fourth. With so few games and such a large field, tiebreakers are going to determine the finish. It speaks to the uneven nature of the region and the gap between “developed” soccer nations pulling from significant populations and the countries with tiny talent pools and limited resources that a win and a +8 goal differential is only good enough for fourth in the standings. Haiti, a minnow in any other context, sits in first after opening up qualifying with a 13-0 victory over Sint Maarten. New Canada coach John Herdman is using the early stages of the Nations League to integrate a younger generation of Canadian players. Included in the 23-man roster he called up for the Dominica game are 17-year old Alphonso Davies, 19-year old Ballou Tabla, 19-year old Liam Miller currently in the youth teams at Liverpool, and 18-year old Jonathan David of Gent. All told, the list features eight players 23-or-under. The logic follows that Herdman can afford to give the young group a chance to play because his team shouldn’t have any trouble with Dominica (ranked 199th in the world) on Tuesday. Subsequent matches against St. Kitts & Nevis (ranked 177) and French Guiana (unranked as a non-FIFA member) shouldn’t be too stressful either. Except, as we’ve mentioned, the table is going to likely turn on goal differential. Herdman himself says that Canada can’t afford to risk any result in the quest for a top-6 finish. The Nations League’s “competitive” element and provision for entry into the Gold Cup next summer cut both ways. If Canada were playing friendlies, regardless of the level of the opponent, Herdman and his team might be working through a number of lineups, formations, and styles. As it is, the pressure is on to show that Canada belongs with the United States, Mexico, and Costa Rica. If Canada is going to prepare for the future, the kids have to play. Appraisals of Herdman’s early work with the national team after moving over from the Canadian women’s program will rest on the balance between progressing and pushing through the future of the side. With nothing on the line but pride and the nebulous notion of “progress” in friendlies, coaches sometimes make choices that don’t feed into any coherent plan. The freedom provided by the friendly atmosphere can be oddly limiting. The Nations League is an obvious positive for most of CONCACAF’s 41 member nations. If the confederation serves all of its member federations and doesn't simply play to the whales of the region, guaranteeing everyone more games that count at least on paper is a good thing. The calculus is a little less straightforward for Canada, who while hardly a power, does occasionally manage to score a high profile friendly every now and then. Still, Canada also goes full FIFA windows without playing or manages a single friendly in a window with two match dates. Turning the national team program back into one that can compete for a World Cup spot means recognizing where you stand and taking the opportunities given. So while the United States is working through friendlies that might or might not matter, Canada is playing “meaningful” game in a brand new competition against Concacaf's lesser lights. Both countries are in weird places, but at least Canada’s weird place comes with games that count.